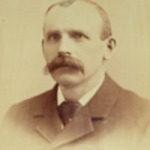 Frank Toepfer, nee Franz Hrncir was born June 10th, 1845. He was a man blessed with an intensely mechanical and inquisitive nature which attracted him to the safety industry. The recent invention of Linus Yale’s “mortise cylinder pin tumbler” lock design most probably drove Frank to open the doors of Toepfer Safe & Lock in 1862. Gottfried Schloemer worked with Frank at Toepfer as a “Cooper” and it was during that time that he approached Frank with the hope of building a “motor wagon” with an attached gasoline engine to make it self-propelling. 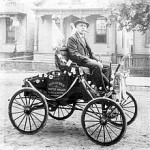 The car was built in the shop on National Avenue and was driven on the streets of Milwaukee in 1890. 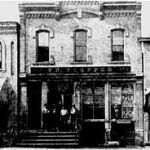 That was a time of great change and Frank learned quickly of the importance of the automobile and so he and the brothers made their expertise work for them by launching an auto repair division in their shop on National Avenue. However, the family never strayed from its roots and continued their lock work and building safes. Their metalworking skills allowed them the opportunity to create some of the most elaborate grillwork in Milwaukee which still endures today. The family proliferated and Edwin Jr (Frank’s Grandson) along with his brothers LeRoy and William took over the business in 1959. Though all three boys had a role in Toepfer, it was Ed Jr. who possessed the same enthusiasm and mechanical wizardry that Frank held. It was his innovation and drive to solve the problems presented to him which led to his design of the universally adopted Electric Strike. The car is permanently displayed at the Milwaukee Public Museum in “The Streets of Old Milwaukee” exhibit along with samples of tools used at Toepfer Safe & Lock from the period. Ron Sr. and Rose Marie Lund purchased the business from Ed and Lou Toepfer in 1982. 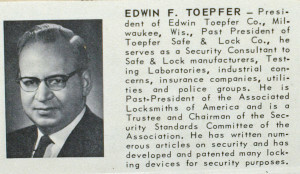 Today the company is privately held and is led by Ron Lund, Jr.
Ron Jr. started working at Toepfer in 1983, directly out of college, and has diligently maintained an awareness of today’s ever changing technologies in order to provide the most current and secure offerings in the industry today.